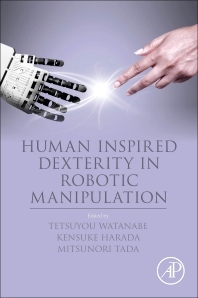 Human Inspired Dexterity in Robotic Manipulation provides up-to-date research and information on how to imitate humans and realize robotic manipulation. Approaches from both software and hardware viewpoints are shown, with sections discussing, and highlighting, case studies that demonstrate how human manipulation techniques or skills can be transferred to robotic manipulation. From the hardware viewpoint, the book discusses important human hand structures that are key for robotic hand design and how they should be embedded for dexterous manipulation. This book is ideal for the research communities in robotics, mechatronics and automation. Dr. Watanabe received his Doctor of Philosophy in Engineering in 2003 in the Kyoto University. His research interest include Intelligent mechanics/Mechanical systems with emphasis in Robotics, Robotic hands, Human assist, Medical Engineering. Kensuke Harada received BS, MS and Doctor degree on Mechanical Engineering from Kyoto University on 1992, 1994 and 1997, respectively. From 1997 to 2002, he worked as a research associate at Hiroshima university. On 2002, he joined National Institute of Advanced Industrial Science and Technology. For one year from 2005 to 2006, we was a visiting scholar at Computer Science Department of Stanford University. From 2013 to 2016, he was a leader of Vision and Manipulation Research Group of Intelligent Systems Research Institute. From 2016, he has been a Professor of Graduate School of Engineering Science, Osaka University. His research interest includes mechanics, control and motion planning of robotic mechanisms such as robot manipulator, robotic hand and biped humanoid robots. Dr. Tada received his Ph.D from Nara Institute of Science and Technology in 2002. In April 2002, he joined Digital Human Laboratory, National Institute of Advanced Industrial Science and Technology, JST CREST Researcher (PD). His researches topics include Fingertip Deformation Measurement for Studies of Human Touch Perception; Development of Optical Force Sensors for Force Sensing in MRI Environments; Incipient Slip Measurement for Studies of Human Grasping Skills.